What a privilege and honour to be part of this event, recognizing the amazing people & organizations that make our community such a great place to live! to all the Community Award Nominees! This morning, I spent the morning filling Christmas Shoe Boxes with some lovely Seniors and a lot of happy helpers. The boxes will go to children all over the world who live in poverty and war-torn countries. These gifts of love will bring incredible joy to each and every child! 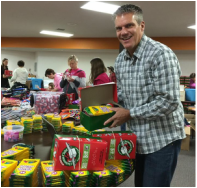 Operation Christmas Child is a project of Samaritan's Purse, a Christian relief organization run by Franklin Graham. To date, Operation Christmas Child has collected and distributed over 100 million shoebox gifts worldwide. In 2013, Canadians donated more than 664,000 Operation Christmas Child shoeboxes for hurting children around the world. Thank you all for your generous donations of gifts and time. Wednesday morning we officially announced the beginning of bus service right to the front door of the FSJ Hospital/Peace Villa. As a City, we are committed to working in partnership with other organizations to build our community. This is another example of how a great partnership between BC Transit, Northern Health, & City has succeeded in making our community a better and safer place to live! Thanks to Fort St. John Paramedics, Darrel Key & John Tebulte, for the meeting & tour of your Ambulance Station. It was great to see the equipment that you work with and learn from you about the challenges you face. After seeing and hearing all about what you do, I have a greater appreciation for the knowledge, skills and abilities you possess which you use to intervene in life-threatening injuries and perform pre-hospital emergency care. We appreciate you and all the vital work you do in our community! Once again, this year, I had the privilege of representing the City of Fort St. John at the 111th Union of British Columbia Municipalities (UBCM) Convention in Whistler, BC. Formed in 1905 to provide a common voice for local government, the UBCM continues to follow that mandate today. Through its resolution sessions, the Annual Convention provides a platform for local government leaders to establish policy directions for UBCM’s activities over the coming year. Along with the Annual General Meeting, Resolutions Sessions, and Elections, there were many keynote speakers and, once again, many informative Workshops, Clinics, and Cabinet Panels. Council also took time during the week to meet with the various Provincial ministries including Ministry of Transportation, Ministry of Energy & Mines, Ministry of Advanced Eduction, Ministry of Justice, and Ministry of Health. This was a great opportunity to boast about Fort St. John and inform them of ways in which the Province can assist us in building a stronger, more vibrant community. Skills Training on the Move! I had the privilege of welcoming Federal Minister of State for Western Economic Diversification, Michelle Rempel to Fort St. John and MC'ing the special event at the North East Native Advancing Society Innovative Learning Centre (NENAS) where she announced over $1.4 million in funding to support the purchase of a heavy equipment operator/mining simulator, a driving simulator, as well as the delivery of a training program for First Nations communities across Northeast British Columbia. The heavy equipment operator/mining and driving simulator is portable, allowing training to be delivered to surrounding communities in northeast B.C. We know that there is going to be an increasing demand for skilled labour and this mobile training simulator unit will go a long way to training and equipping young men and women so that they can engage in the many employment opportunities that are opening up even as we speak. For many, this will be their first step to building a bright and prosperous future for themselves and their families. We need every level of government to step up and play an active role in supporting economic growth and long-term prosperity, and ensuring that we have what it takes to move our country and our communities forward. Tomorrow’s success and prosperity will be only as strong as today’s investment. Thanks, Minister Rempel, for your visit to BC's Energy Capital, bringing this good news to our corner of the country. O Canada . . . Day! You couldn't have asked for a nicer day for our Canada Day Parade & Celebrations! 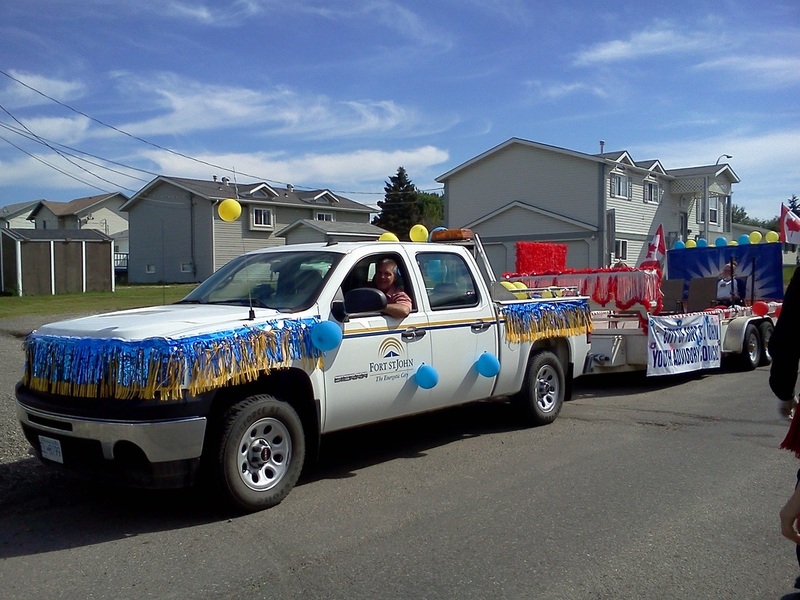 This year, I volunteered to drive the City Vehicle that towed the City Float, which was decorated by our energetic Youth Advisory Council. It seemed like there were more people than ever lined up along the parade route. It was a most excellent day, including the fantastic Party in the Park, and concluding with a great display of fireworks! A huge thank you to all the wonderful people who helped to make the day such a huge success! Announcing the Arrival of WestJet! 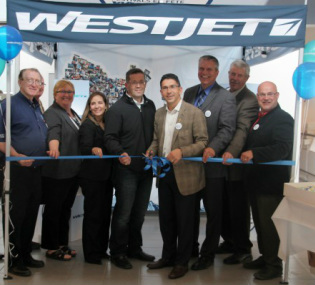 We celebrated the arrival of WestJet into Fort St. John. It was June 27, 2012 that a team of us from this community travelled to the WestJet headquarters in Calgary to convince them that "It Just Makes Sense!" to provide service to Fort St. John. So almost one year to the day, it was truly exciting to see them touchdown at YXJ for the first time. The arrival of WestJet provides more service and more options to each one of us. This is also a good indicator of the confidence companies like this have in the continued economic growth in our region. Already, WestJet has created 16 jobs at the North Peace Airport at both the check-in counter and baggage handling. It's a beautiful evening at the Community Garden, where NEAT is being presented with a cheque for $50,000 from the RBC Blue Water Fund, which they will use to focus on storm water management. For now, the Community Garden needs someone to donate a truck load of water to fill that tank behind me. Come on, water companies, why don't you contact NEAT and tell them you'll fill that tank for them? !